EJ is a tactile learner. She thrives in her Montessori school, but because we are beginner parents to this type of teaching/learning, I often feel at a loss for how to help build on what she is doing at school. I just got a ton of great ideas this past week at our parent/teacher conferences, but (by chance) she also worked on a little "art" this weekend that is perfect to assist in learning. 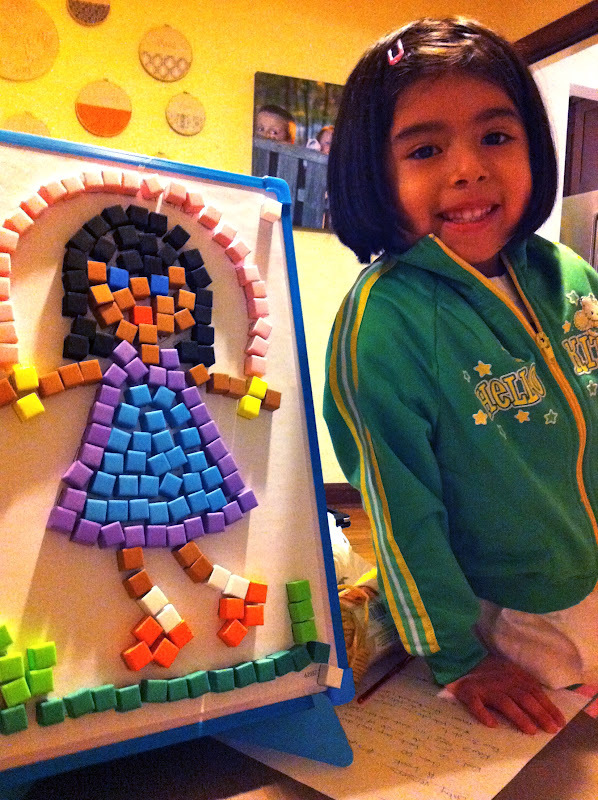 Magnetic Mosaic Kids was a Christmas gift that EJ put on her list after seeing it in a catalog. There are a ton of colored foam blocks and paper sheets/patterns that you put on a large magnetic board. You determine where each color block goes by matching the numbered square on the paper with a "key" that assigns a color to each number. So basically it's working on number recognition (up to 12), fine motor skills, chart reading and dexterity (and if you involve your mom and little sister in the process, then a little teamwork is thrown in there too). Of course she didn't seem to notice the work involved, just the awesome art she created! And I couldn't help but notice that her first creation looked a little bit like its creator too. Best part though...very little clean-up! EJ, that girl skipping rope is so beautiful. What a good job you did. Grandma is so impressed. Hope Mom will take pictures of other things you do. GOOD JOB !!!! what fun! a great self-portrait!! the tactile learning is a little difficult just because it's not what I'm used to. But this was a great idea and great gift. This along with teaching her how to read a book yesterday added to your SuperMom status! Her artwork came out great! My daughter is also a tactile learner. Do you happen to have the name/website of the catalogue you found this item in? I'm working oun trying to get things together for the upcoming school year!